□ on 12 February 2016, a decision of the Central Election Commission established an interdepartmental expert working group tasked to review the OSCE ODIHR recommendations following the observation of the 2015 presidential election with a view to improve the electoral process in Belarus. □ on 17 February 2016, representatives of the campaign “Human Rights Defenders For Free Elections” wrote to Lidziya Yarmoshyna, head of the Central Election Commission, offering their expertise and proposals that could be useful in the work of the interdepartmental group. 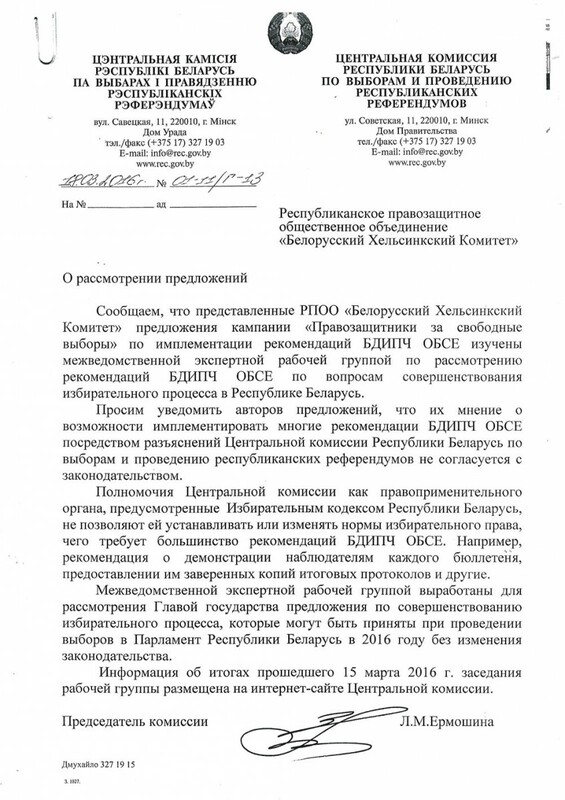 □ in early March 2016, the human rights activists sent to the interdepartmental group their proposals on the implementation of the OSCE ODIHR recommendations, which contained 30 items with detailed justification. The campaign’s experts focused on the ODIHR recommendations, which do not require amendments to the Electoral Code and other legislation, and, therefore, could be implemented before the launch of the 2016 parliamentary election through the CEC’s regulations. □ on 15 March 2016, the final meeting of the interdepartmental working group was held. CEC chairperson Lidziya Yarmoshyna told BelaPAN that the group developed a number of proposals on measures to improve the electoral process, taking into account proposals that were submitted by both the OSCE ODIHR and the campaign “Human Rights Defenders For Free Elections”. At the same time, these proposals have not been made public. □ on 18 March 2016, the CEC sent to the campaign’s representatives an official response to their proposals, which contradicted Yarmoshyna’s earlier statements in the media. Human rights defenders criticized the inconsistency in the approaches used by the CEC and the opacity of the expert group’s activities. □ on 8 August 2016, during the parliamentary election campaign, a mission of the OSCE ODIHR met with representatives of “Human Rights Defenders For Free Elections”. During the meeting, special attention was paid to the work of the interdepartmental group: its results were still unavailable to either of the parties. □ on 17 January 2017, the campaign’s experts presented their priority recommendations for changes in the electoral legislation of Belarus. Simultaneously, the interdepartmental working group continued its work in a modified composition and by 1 February 2017 was supposed to analyze the ODIHR recommendations put forward in the final report following the observation of the parliamentary elections on 11 September 2016 and to develop proposals to amend the electoral law for further consideration by the Central Election Commissions and President Lukashenka. □ on 31 January 2017, one of the campaign’s coordinators, chairman of the Belarusian Helsinki Committee Aleh Hulak, was invited to a meeting of the interdepartmental group, which considered the OSCE ODIHR recommendations. Aleh Hulak presented the campaign’s priority recommendations. However, following the meeting it was unclear which of the proposals discussed by the interdepartmental group would be submitted to the President. □ on 1 February 2017, proposals developed by the interdepartmental group were to be submitted to the President. However, no information about this was made public. □ on 20 March 2017, President Lukashenka was expected to meet with the CEC’s head and consider the results of the interdepartmental group’s work, but no information about such a meeting was published on either the CEC website or in other media. □ in early April 2017, the campaign’s representatives reminded that the earlier the Central Election Commission announced the consideration by the Parliament of the implementation of the ODIHR recommendations in the electoral legislation. However, the schedule of meetings during the spring session of the House of Representatives did not mention the issue. The absence of any public information on the announced steps to improve the country’s electoral laws prompted the human rights defenders’ conclusions that the work of government bodies in this direction was suspended.